Even though Internet, social media, and mobile usage is on the rise all over the world, adoption of these technologies still greatly varies. Internet usage ranges from 88% of the population in North America to 19% in South Asia. 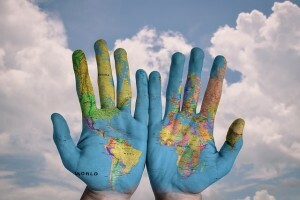 The ways in which people around the world use the Internet and social media are also distinct, and present unique challenges to marketers. So instead of applying a one-size-fits-all marketing strategy across the board, it is important to understand where different regions are in adopting Internet usage and take that into account. Today, we’ll look at six distinct regions – Africa, Asia, Australia, Europe, North America, and South America – and see how brands are successfully adapting their marketing techniques and strategy to match consumers’ relationships with the Internet and social media. As a whole, Africa still has a relatively low amount of Internet users, with only 26% of its population having Internet access. That being said, an astonishing number of those users primarily use mobile. Of all page views in Africa in the past year, 70% came from mobile phones. Nigeria has the highest percentage of page views from mobile of any country in the world with 76%, and South Africa is not far behind. Given this relatively low access to Internet and heavy reliance on mobile, some of the most successful ad campaigns have developed from the goal of providing more widespread access. Considering the popularity of mobile across Africa, it should come as no surprise that one of the most talked about recent ad campaigns was based on providing Internet access to rural communities. 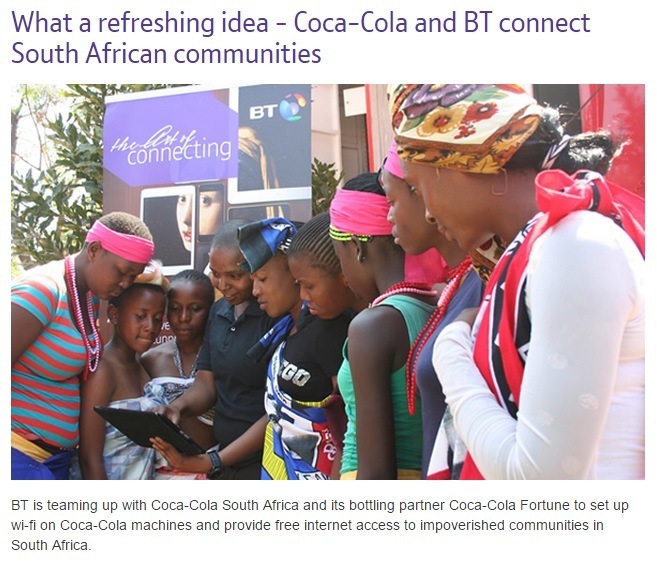 Coca-Cola South Africa partnered with BT Global Services in 2014 to install WiFi-enabled vending machines near schools, shopping centers, and other busy locations. These machines allowed users to connect for free and use the Internet on their mobile devices, much like the free WiFi other countries have in coffee shops, airports, and other high traffic locations. This was a huge win for both companies. By recognizing South Africa’s increased interest in the Internet – especially on mobile devices – they were able to meet a need while also promoting their products and services. Although the amount of Asia’s population that uses the Internet averages out to 35%, there are huge variations across the continent. When broken down into smaller regions, 51% of East Asians are Internet users, while only 19% of South Asians are – the lowest of any region in the world. It makes sense, then, that marketing strategies in across the continent vary greatly depending on whether or not consumers have access to online content. In areas where consumers are heavily reliant on technology, traditional methods of digital marketing are nothing new to consumers. In order to stand out, brands must be innovative. 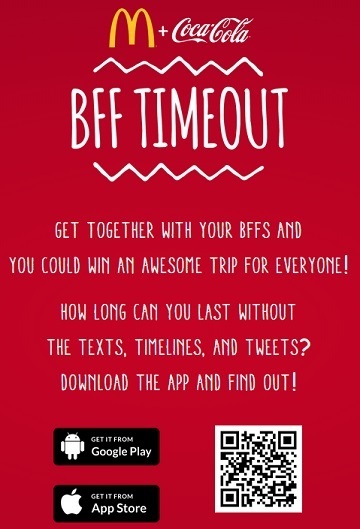 McDonald’s and Coca-Cola came up with an interesting way to get consumers’ attention when they launched their “BFF Timeout” app in the Philippines. Customers who purchase BFF Bundles (which include both McDonald’s and Coca-Cola products) can download the app and connect with whoever they share the meal with by logging in to their Facebook accounts. The app is part of McDonald’s larger #BetterTogether campaign in the Philippines, which promotes real-life connections and family values. Australian are very familiar with the Internet, as 69% of the country’s population are frequent users, and 45% use social media. That being said, it is not necessarily an easy place to succeed with Internet marketing. In this study on young Australians’ use of Facebook (by far the country’s most popular social network), respondents reported that their most valued tool was the private messaging feature. This means that many users primarily see social media as a way to interact with people they know – not brands who are trying to spread ideas and sell products. This lack of engagement requires an altered strategy for brands who want to be successful on social media. Australian users are less inclined to like company pages and comment on or share their posts, so companies must make those actions seem more attractive and beneficial to consumers. 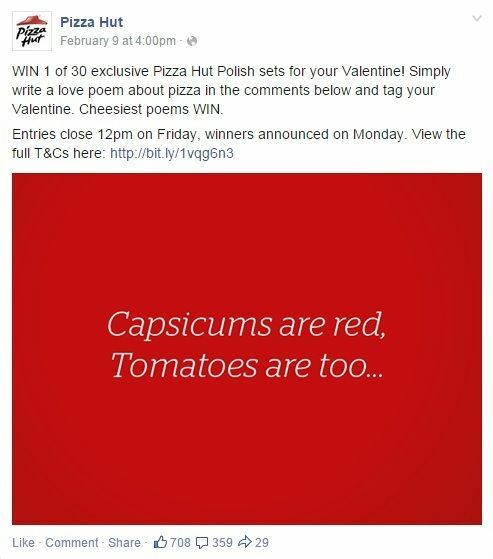 One international brand that has developed its social strategy for Australian social media users is Pizza Hut. They maintain different pages with posts relevant to consumers in various countries (ex. Super Bowl posts for Americans and posts about the Socceroos for Australia), but also vary their strategies for generating engagement. Their most recent attempt was the Valentine’s Day poetry competition they hosted this year. 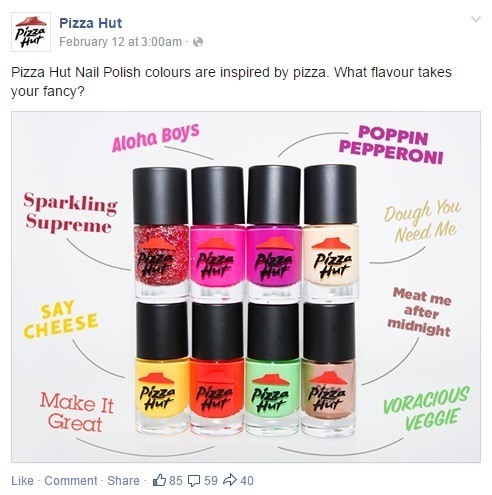 The brand launched a limited-edition line of nail polishes in colors like “Say Cheese” and “Poppin’ Pepperoni,” but did not make them available for purchase. This type of contest was ideal for a large brand who knew that entries would be limited. The original post received 708 likes and 359 comments, and entries only account for a small portion of those comments. This made reading the submissions and choosing winners relatively easy, even though the same contest would be a huge undertaking for marketers in countries with higher engagement (like the US). Although engagement levels with Australian social media users is still significantly lower than those of their American and European counterparts, these contests that encourage consumer participation get much more attention for brands than posts that simply advertise products. Internet users account for 70% of Europe’s population, making them the second-most connected region in the world behind North America. They are also second in social media usage, with 46%. As the region with the second-highest Internet and social media usage worldwide, Europe is familiar with digital marketing. It is home to millions of tech-savvy consumers who are used to interacting with brands online, which might make it seem like an easy place to launch an ad campaign. The obstacle here, however, is the language barrier. There are over 23 different languages spoken across the continent, making it difficult to create a marketing strategy on the same scale as the United States. It is doable, though, which France’s state-owned railway company, SNCF, proved with their international travel campaign. The company operates websites and social accounts in the native languages of all of the countries it transverses, but connected them all by creating a video titled “Europe. It’s Just Next Door.” The railway placed door frames in well-traveled areas of Europe that, when opened, revealed TV screens with live connections to other destinations. The only change the company needed to make before sharing the video across all of its social channels was the five country names displayed during the video and the text at the end. This was a unique take on the challenge of international marketing, and the interactive nature of the campaign garnered attention from consumers all over Europe. The original video, posted by SNCF’s ad agency, TBWA Paris, has over 1.7 million views – pretty impressive for an advertisement. North America has the highest percentage of Internet users for any region of the globe, with 88%. It also has the highest percentage of social media users, with 58%. Social campaigns are hugely popular in North America, which makes sense considering that it has the highest percentage of social media users of any region in the world. This was beneficial to companies at first, as it provided them an entirely new way to reach consumers. Now that nearly every company invests in social, however, it takes much more to stand out. Although campaigns that encourage audience participation can be very successful, it is becoming difficult to get people to contribute as more and more companies attempt to crowdsource. The San Francisco-based short-term rental company Airbnb tackled this issue by creating an entirely new take on social media campaigns. The company released a list of shots they wanted, and received 750 submissions from around the world. They then selected 100 of the six second clips and compiled them into the first-ever short film made up of vines, called “Hollywood & Vines.” The entire video is only about four and a half minutes long, but its innovative concept generated over 1,000 tweets with the hashtag #AirbnbHV. South America is an interesting region to study when it comes to digital marketing, as they are the the fastest-growing Internet population in the world. As of 2015, 50% of the population has Internet access, and 43% use social media. It is also interesting to note that they have the highest percentage of Internet users who also use social media, with 86%. The average worldwide is 69%, meaning that of all Internet users in the world, the Latin American population is most drawn to social media. Given the huge popularity of social media, Latin America is an ideal place for brands to use social media marketing. One brand that does a great job of this is Sony Brasil. They took full advantage of the fact that the 2014 FIFA World Cup took place in Brazil, and posted pictures and videos throughout the entire event. This coverage was wildly popular with Brazilian consumers, and the majority of their posts actually received more likes and comments than posts on the original Sony Facebook page during the same time period, despite the fact that the Brazilian page has 3.4 million likes and the original has 7.1 million. 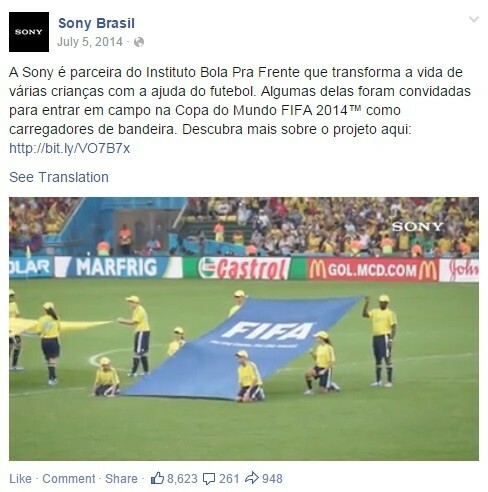 This particular clip shows children from Bola Pra Frenta, an educational institute that Sony partnered with, carrying the FIFA flag onto the field. It received lots of positive feedback from fans, much like the rest of Sony’s FIFA coverage. This shows that Latin American consumers are a great audience for social media marketing, and are more than willing to engage with brands if they make an effort to create content that is relevant. So what should you take away from of this? That Australian consumers require more effort to engage with? That North Americans love innovative social media campaigns? That South Americans are crazy about social media? The most important thing you should realize is that knowing your audience and their relationship with the Internet is essential for a successful Internet marketing strategy. Companies like Coca-Cola clearly do their research on various consumers’ relationships with technology; in Africa, an app that encourages users not to use phones when only 26% have Internet access would be unnecessary. But in the Philippines, free WiFi wouldn’t be a great incentive, as everyone already has it. Although I’m not saying that you need to create apps or provide free vending machines, their dedication to consumer research is worth imitating. If you are trying to come up with a digital marketing strategy or improve upon the one you already have, just keep this in mind: knowing your audience is the most important component of a successful campaign. Invest some time and energy into figuring out what they want, and you’ll have a much easier time deciding what to create. If you’d like to learn more about worldwide Internet and social media usage so you can better target your marketing campaigns, take a look at this presentation by We Are Social for some insights. Have any questions about this post or worldwide marketing? Let me know in the comments!